Killer Characters: Hey, It's Joe! Hi, everyone. I know that my young buddy Carrie Kennersly has been blogging here sometimes, and so have some of her other friends from Knobcone Heights and even her dog Biscuit. Me? This is my first time here. My wife Irma and I own Cuppa-Joe's. Our restaurant's name makes sense 'cause we sell some good coffee there--and, hey, I'm Joe. Carrie calls both Irma and me the Joes sometimes. She's a really nice person, and we sometimes treat her as our daughter. Plus, she seems to enjoy us, too, and treats us as her parents. Of course we also have a real daughter, Gina, who works at our place. We also have a son. He's a lawyer. Love 'em all. We admire Carrie for how busy she is. Not only is she a veterinary technician, but she also owns Barkery & Biscuits, where she bakes and sells dog treats she developed for her veterinary clinic, as well as Icing on the Cake, the barkery's adjoining bakery. And if we didn't already love her, we certainly would now because she introduced us to Sweetie, our adorable little dog who looks a bit like Biscuit--gold in color, looks like a poodle-terrier mix. Sweetie was living at Mountaintop Rescue when Carrie found her. Carrie let us know about Sweetie, and of course the sweet dog is now a member of our family. Of course we worry about Carrie. She always seems to be involved in murder investigations. I guess she's pretty good about figuring them out, but I'm concerned about her staying safe. 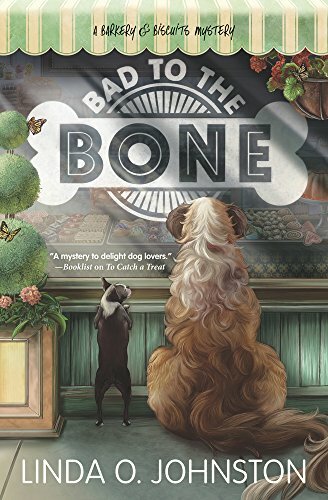 Anyway, her most recent adventure was memorialized in Bad to the Bone, which came out in May of this year. Yes, Irma and I are mentioned, too--and so's Sweetie. Hey, this has been fun. Maybe I'll ask Carrie if I can blog here again sometime.